On May 20th, the Transit Riders Delegation met with Seattle City Councilmembers Sally Bagshaw, Nick Licata, Mike O’Brien, and Kshama Sawant. We presented our affordable transit goals & explained how we think the City of Seattle can work with King County and Metro to take a leading role in achieving them. Last month the Transit Riders Delegation for affordable transit met with King County Councilmembers. Dozens of riders spoke about the importance of affordable public transit to their quality of life, and we laid out a number of goals that we hope to see King County and Metro work towards. We believe the City of Seattle has a role to play in achieving these goals, so we are also submitting to you the written materials that we presented to the County Councilmembers. 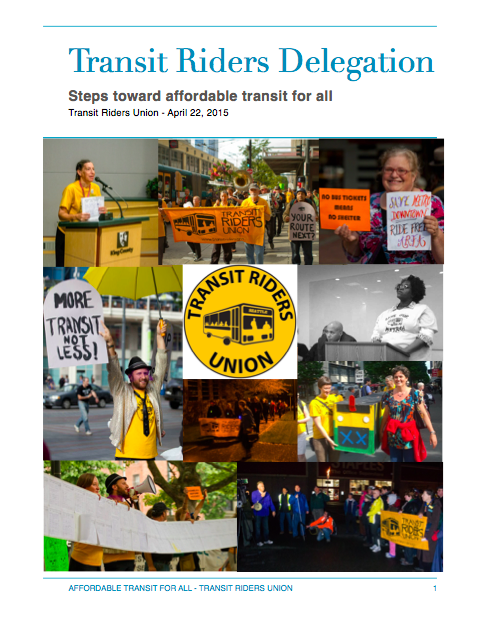 Included are a campaign letter signed by thirty-five service, advocacy, social justice, and labor organizations; a report detailing our affordable transit goals; written testimony from transit riders; and petitions from students. 1. ORCA Lift enrollment: This is great program, but too many riders still don’t know about it or have not found it easy to enroll. $2 million from Proposition 1 is supposed to aid low-income riders. The City of Seattle needs to focus on getting loaded ORCA Lift cards into riders’ hands. TRU is working with allies who are on the front lines administering this program, and we will be coming back with specific recommendations as to how this money can be used effectively. 2. Fund free and reduced-fare passes: Our affordable transit goals include free transit passes for all public school students and low-income youth, senior and disabled riders; and reduced-fare passes for all Seattle Colleges District students. The City of Seattle has more options for funding transit than King County. We urge the city to step up and help to start these programs. 3. Night Owl service: Metro’s Night Owl network needs to be improved and expanded. We understand that a restructuring of late-night service is in the works for next year. We want to see changes that make the system more accessible, and we really need a huge addition of late night service hours. Buses on most routes should run at least every half hour until 2:30 AM, and no less than every hour thereafter. This is a equity issue for low-income workers whose livelihoods depend on reliable round-the-clock bus service, and it is a safety issue for everyone. 4. Light Rail equity: We support a Northgate Bike/Pedestrian bridge and we believe this project should be funded by Sound Transit in lieu of building a parking garage, which is inconsistent with Seattle’s Comprehensive Plan. We ask the City Councilmembers to pressure Sound Transit on this front, and to ensure that one way or another this bridge is funded and built in a timely manner. We support Light Rail station placement at 130th and 155th instead of 145th, and the addition of a station at Graham St.
5. Strengthen Seattle’s Commute Trip Reduction (CTR) program: Employers depend on our public transit system, and they need to contribute more to keeping it running. One way to accomplish this is to strengthen Seattle’s Commute Trip Reduction Program so that more employers subsidize transit passes for more of their workers. As it is, the program applies only to nine-to-five office workers at businesses with over 100 employees. How about extending it to workers who start work at any time of day, and to part-time workers? How about requiring some minimum contribution to workers’ transit costs? Strengthening this program will help workers while decreasing traffic congestion, carbon emissions and pollution. 6. Progressive transit funding: Last year, the Transit Riders Union advocated for an Employee Hours Tax on business and a Commercial Parking Tax increase as more progressive alternatives to the sales tax portion of Prop 1. Every year we wait to implement these taxes, we lose tens of millions of dollars in progressive revenue that could have been used to improve and expand our public transit system. Even with new service coming, Seattle’s need for public transit vastly outstrips the pace of action. Buses are overcrowded, and they will still be overcrowded after service is added this spring and fall. Please use these progressive funding options to improve and expand our public transit system and make it affordable for all. 7. Lobby Olympia: TRU has worked with pro-transit state legislators on bills that would give local governments new funding options. A Non-Residential Parking Tax (HB 2186) would close the loophole in the existing Commercial Parking Tax (which would be deducted as a credit), generating new revenue from vast parking lots at big box stores and Northgate Mall while encouraging a better use of urban space and reducing stormwater runoff. We have also urged consideration of a Payroll Tax on employers, such as funds transit in Portland and New York City; a capital gains tax; and a progressive MVET to replace flat car tab fees. We will continue to push for these and other progressive funding options, but we need local elected officials to lobby with us and make it clear that you would use these options if they were granted. 8. But don’t wait for Olympia: Seattle needs to take the lead in reforming Washington State’s regressive tax system. We support a local progressive income tax on high earners. This money could go toward expanding mass transit and creating green jobs, building affordable housing, funding education and human services, or so many other things our city needs. The road to a state income tax starts in Seattle. 9. Amazon needs to contribute: Amazon is requesting an Alley Vacation in Block 21 of Denny Triangle. Their proposed development includes underground parking for 835 vehicles in an area with notoriously bad congestion. Clearly part of the solution is more and better public transit. Amazon’s success depends heavily on our taxpayer-subsidized public transit system, and Amazon’s rapid growth is placing demands and strains on this system that will require significant public investment and ongoing expenditure of public resources. We will all be subsidizing the costs of getting Amazon’s thousands of new employees to work, and as Metro’s costs rise faster than revenue, there is continual pressure to raise fares. We would like to propose one simple way Amazon can contribute to the public transit system they depend on, while helping to ensure mobility for the low-wage workers who must also commute to work in the South Lake Union and Denny Triangle neighborhoods. How about sponsoring the ORCA Lift program, similar to how Google is sponsoring free bus pass programs in San Francisco? This would free up money in Metro’s budget to expand service and lower fares for all riders. Until Amazon begins to take their responsibilities to our community seriously, the City of Seattle should not grant them use of our public space.